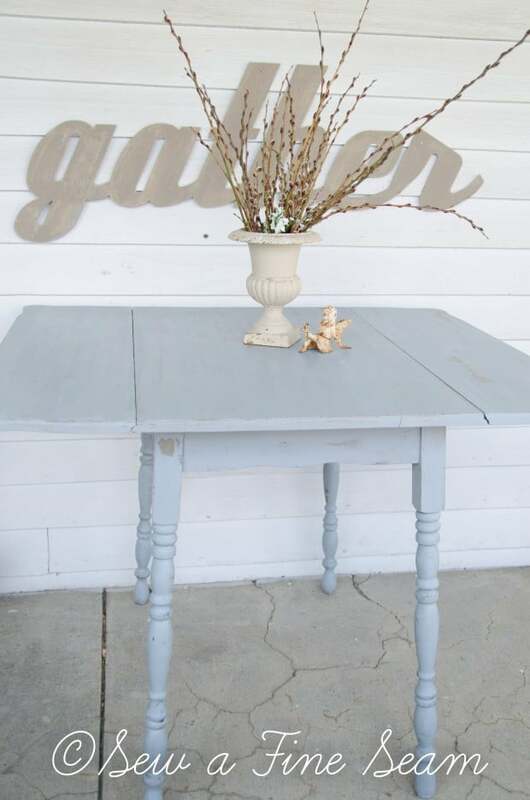 I bought a cute little table from a friend a few months ago and the week before the Springfield flea I painted it. 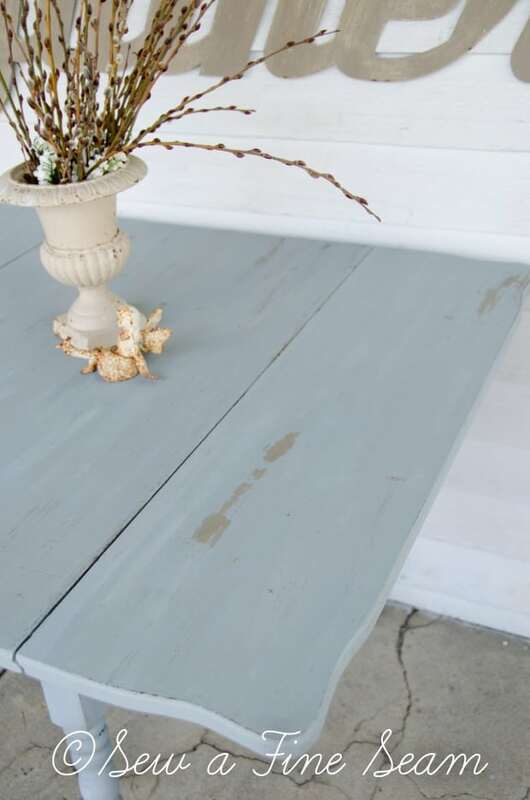 I used chalk paint (coco) for the first coat and then topped that with Milk Paint in shutter grey. I used some hemp oil in a few places to help it chip a bit because milk paint doesn’t chip when used on chalk paint. 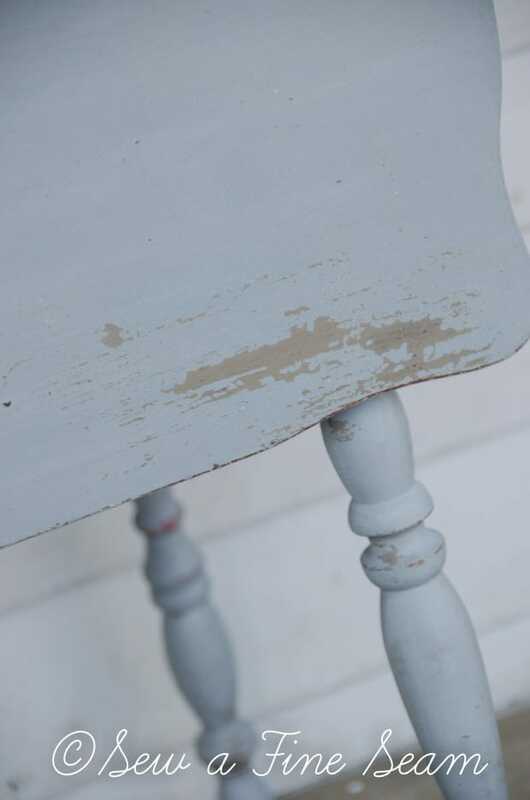 The hemp oil keeps the milk paint from adhering and creates the delightful chippy look I love. UPDATE: using hemp oil to create chipping is a bit of a process. 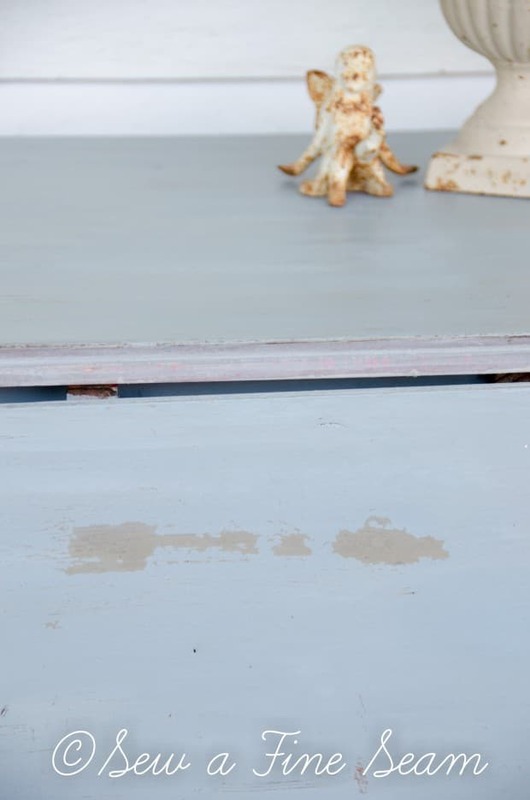 The hemp oil has to be wet – you put it on right as you are ready to paint the area – the heavier you apply the hemp oil the more chipping you will get. And when you paint you paint IN ONE DIRECTION across the area – THIS IS IMPORTANT! If you go back and forth and overpaint you will not get the chipping! Here is a before pic. In its ‘before’ condition the table sat on my porch and I used it in my photo shoot of my Easter pennant Banners. And here is the after. I fall more in love with Shutter Grey every time I use it. The chipping was all caused by using hemp oil on the chalk paint layer. I helped it along by sanding well. 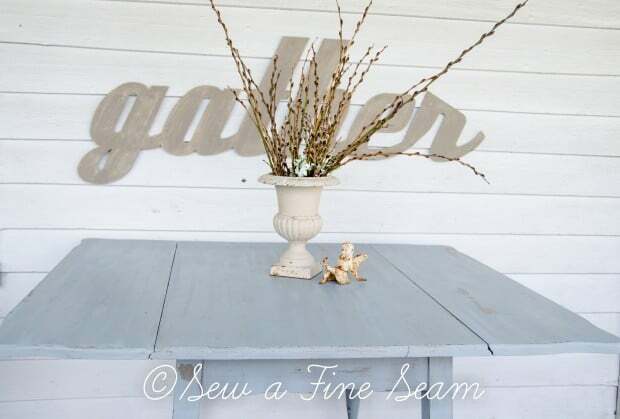 I love how the milk paint creates an authentic old look. I took the table to The Springfield Flea and it found a new home with my friend Stacy, who I shared a booth with. It did look quite cute here didn’t it? It’s been replaced now with another table that I’ll take to my next event. I really need a storage shed so my front porch doesn’t always look like I’m about to have a porch sale. Thanks Susan – there is a bit of a trick to how you use the hemp oil – I’m working on a chair and plan to blog about the how to! Great job on the table! 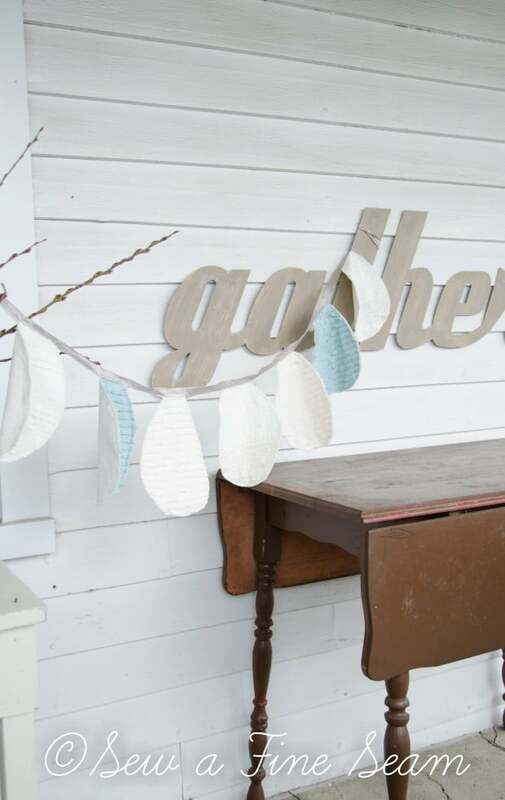 How fun to have a new look on your porch with every piece of furniture you transform! Thanks Susan! Yep, my porch is always changing! Along with the furniture in my living room! I love that table in it’s new color! Your friend is a lucky gal to now own it. It must be hard to part with things you makeover sometimes. Love, love, love it! Quick question. I thought milk paint is used on bare wood? How did you manage this? Hi Diana, yes, Milk paint was formulated for bare wood – it’s a centuries old paint. But it can also be used on any surface you want to put it on. you never know for sure what it’s going to do when applied over a surface that already has a finish. It may chip a little, it may chip a lot. There is a bonding agent you can put in it to make it stick to most surfaces if you don’t want chipping or if you want to control how and where it chips. I love the stuff and use it most of the time now. Thanks so much Loi – honestly sometimes I wonder too how I do it all. Then I look at all the things that need done to my house and I realize I’m NOT doing it ALL! Very pretty, you do such great work. Thanks Daniela – there is a bit of a trick to how you use the hemp oil to make it chip. I’m working on a chair and I’ve been taking pics of the process and will be sharing sometime soon! I love how this looks Jill ~so wonderful! the color is really great! perfection!! love the color – and the sign! Thanks Kelly! And the sign is very fitting there – you should see the stuff I’m accumulating for my July event! Jill, everything about your photo is delightful! 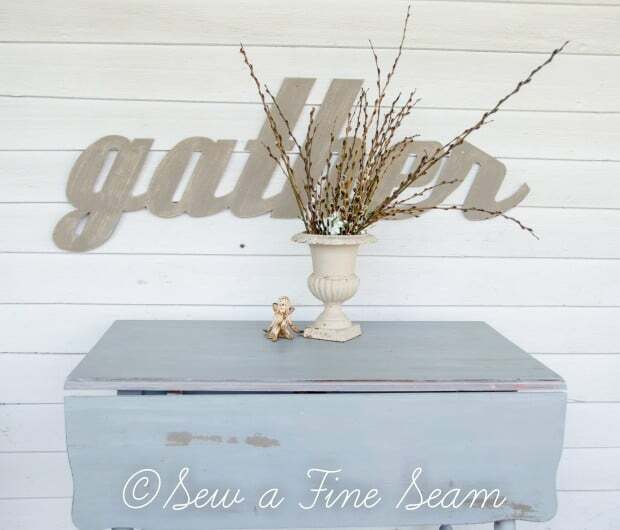 The table looks lovely, and the “Gather” sign above it is just icing on the cake! I do hope you’ll drop in and share it at Knick of Time Tuesday! Thanks Angie! I’ll share if I can – I have been so busy it’s hard to find time to get stuff linked up! Lovely table-you did a great job with it! What I wander is did you use Bonding agent to make MMS color to stick on ASCP? No I did not use bonding agent. 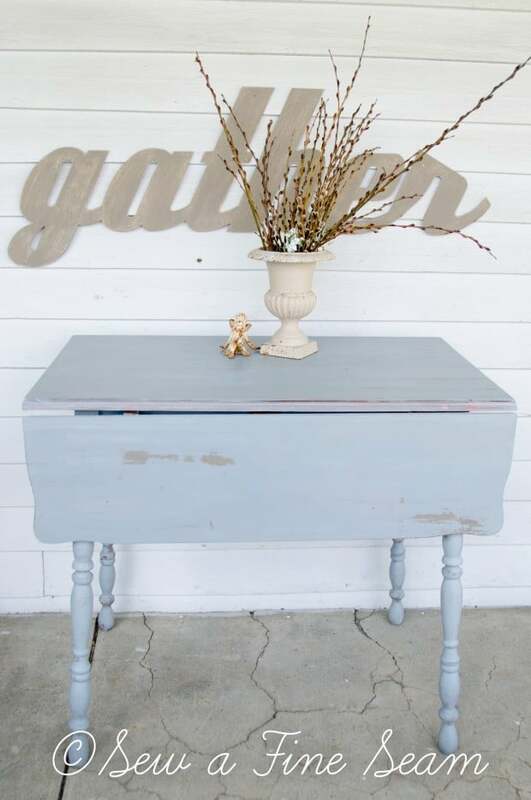 Chalk Paint is a wonderful base for milk paint if you don’t want chipping. Milk paint sticks to it like glue! I used hemp oil to get the chipping on this piece.